Caring for your grass is the first step to achieving and maintaining a beautiful landscape. Keep in mind that specific care instructions will vary depending on the type of grass you have on your property. In general, however, you’ll want to begin by taking time to seed and fertilize your yard every spring. Before fertilizing, you might consider aerating your yard to ensure the best penetration and results. Spreading grass seed throughout your yard and watering it accordingly will help your grass grow thicker and healthier throughout the summer. 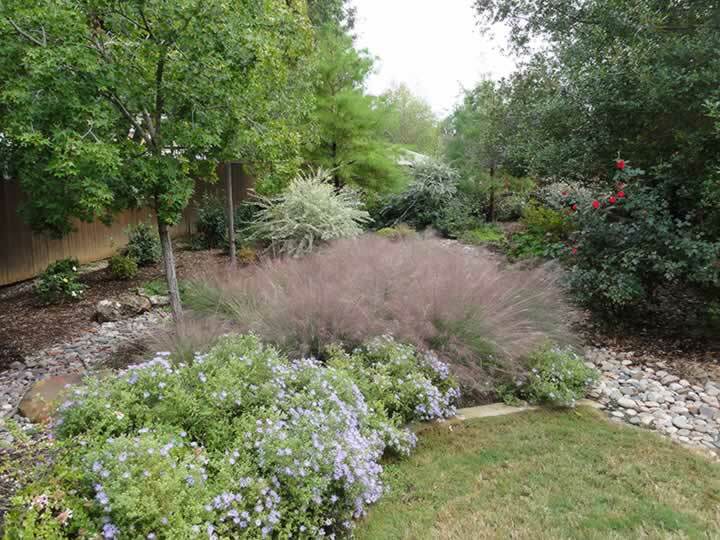 You may also want to address sparse or bare areas with a grass seed patch for better results. Mowing your lawn regularly is another important step for maintaining your landscaping. An overgrown lawn is not a good look and can be harmful to the health of your grass. At the same time, cutting grass too short can cause it to die. Ideally, you should mow regularly with your mower blade set towards the highest setting. Taking time to properly water your lawn is also a must. About an inch of water per week is ideal for most types of grass. Depending on the size of your lawn, you may choose to water it manually using a garden hose with a wide sprayer attachment or utilize a sprinkler/irrigation system. Either way, watering your lawn regularly will keep the grass green and healthy, even during dry spells. If you have any trees and/or shrubs on your property, make sure to prune them as needed. For most trees, branches should be pruned at least once a year during the spring months. This will help to get rid of any dead branches and limbs, allowing new and healthier ones to grow and elongating the life of the tree or shrub. While pruning, it’s also a good idea to take the time to lay some mulch around your trees and shrubs. Mulch can help your plants absorb water more efficiently while also adding a clean look to your landscaping. If your trees show any signs of disease, it’s important to contact a local arborist as soon as possible. They will be able to evaluate the tree, determine a diagnosis, and come up with a plan for treatment where applicable. If needed, an arborist can also remove dead or dying trees from your property. Flowers can add beauty to your landscaping, but it’s important to choose the right flowers for your climate and lifestyle. If you don’t have a lot of time to spend on maintaining your yard, for example, you’ll want to opt for hardy flowers that don’t require a lot of care. If you live in an area with minimal rainfall, you may also want to choose drought-resistant flowers that will not require as much manual watering. No matter which type of flowers you choose for your property, you’ll generally want to fertilize them as soon as they’re planted. This will help to give them the extra nutrients to keep them healthy as they grow. Another important care tip to keep in mind when it comes to your flowers is to pluck away dead flowers as needed. This will help new buds form and will keep your plants as healthy as possible. Mulching flower beds is another step that will promote the health of your flowers. Mulch helps plants retain moisture while also keeping them better protected against the elements. Laying down about an inch of mulch is ideal for most types of flowers. Taking care of your landscaping can be a time-consuming feat, but all the effort is worth it. If you’re looking for help in making landscaping choices that will best suit your needs and lifestyle, Landscape By Design is here to help. Contact us today to set up your free consultation or to find out more about our landscaping services.